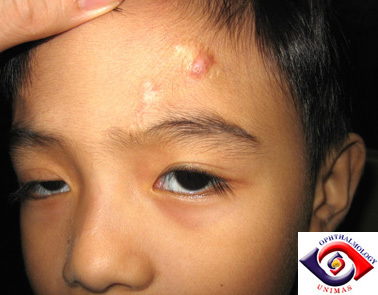 This 6-year-old boy underwent frontalis suspension for congenital ptosis 2 years ago. The material used was mersilene mesh. Since the operation, he had had two abscesses removed from the wound at the incision sites on two occasions. He returned recently because of a swelling in his forehead. a. What is mersilene mesh? b. What is the possible diagnosis shown here? c. What are the common complications with mersilene mesh when used for frontalis suspension? d. What is the best material for frontalis suspension? e. How would you manage the patient?